You can put an instance that is in the InService state into the Standby state, update or troubleshoot the instance, and then return the instance to service. Instances that are on standby are still part of the Auto Scaling group, but they do not actively handle application traffic. You are billed for instances that are in a standby state. For example, you can change the launch configuration for an Auto Scaling group at any time, and any subsequent instances that the Auto Scaling group launches use this configuration. However, the Auto Scaling group does not update the instances that are currently in service. You can terminate these instances and let the Auto Scaling group replace them. Or, you can put the instances on standby, update the software, and then put the instances back in service. You put the instance into the standby state. The instance remains in this state until you exit the standby state. If there is a load balancer or target group attached to your Auto Scaling group, the instance is deregistered from the load balancer or target group. By default, the desired capacity of your Auto Scaling group is decremented when you put an instance on standby. This prevents the launch of an additional instance while you have this instance on standby. Alternatively, you can specify that the capacity is not decremented. This causes the Auto Scaling group to launch an additional instance to replace the one on standby. You can update or troubleshoot the instance. You return the instance to service by exiting the standby state. After you put an instance that was on standby back in service, the desired capacity is incremented. If you did not decrement the capacity when you put the instance on standby, the Auto Scaling group detects that you have more instances than you need. It applies the termination policy in effect to reduce the size of the group. For more information, see Controlling Which Auto Scaling Instances Terminate During Scale In. If there is a load balancer or target group attached to your Auto Scaling group, the instance is registered with the load balancer or target group. Amazon EC2 Auto Scaling does not perform health checks on instances that are in a standby state. While the instance is in a standby state, its health status reflects the status that it had before you put it on standby. Amazon EC2 Auto Scaling does not perform a health check on the instance until you put it back in service. For example, if you put a healthy instance on standby and then terminate it, Amazon EC2 Auto Scaling continues to report the instance as healthy. If you return the terminated instance to service, Amazon EC2 Auto Scaling performs a health check on the instance, determines that it is terminating and unhealthy, and launches a replacement instance. The following procedure demonstrates the general process for updating an instance that is currently in service. Choose Actions, Set to Standby. On the Set to Standby page, select the check box to launch a replacement instance. Leave it unchecked to decrement the desired capacity. Choose Set to Standby. You can update or troubleshoot your instance as needed. When you have finished, continue with the next step to return the instance to service. Select the instance, choose Actions, Set to InService. On the Set to InService page, choose Set to InService. 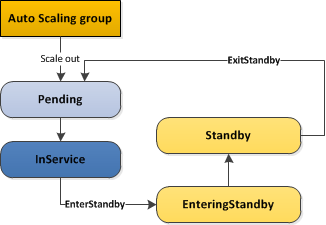 Move the instance into a Standby state using the following enter-standby command. The --should-decrement-desired-capacity option decreases the desired capacity so that the Auto Scaling group does not launch a replacement instance. The following is an example response. Notice that the status of the instance is now Standby. The following is an example response. Notice that the status of the instance is InService.